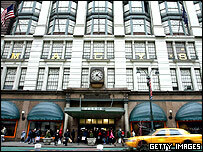 Is the department store on its last legs? Should we get ready to mourn an institution that served us well some decades ago but whose time has come and gone? 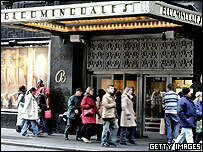 The questions are begged by the take-over of May Department Stores by Federated Department Stores for $11bn. There's no doubt the combination is better able to fight its corner - but the question is whether habits and changing ways of shopping make department stores a losing format. Of course, Terry Lundgren, Federated's chairman, president and chief executive, was confident (how could he not be? ): "We have taken the first step toward combining two of the best department store companies in America, creating a new retail company with truly national scope and presence". There was a time relatively recently when no shopping mall in America seemed complete without a Macy's or a Bloomingdale's (both owned by Federated). But now, not even that is true - Target, Sears and a string of other chains are taking their place as the corner anchors of the big malls. And the traditional place of department stores in city centres is clearly under threat. They grew in an age of new urban wealth. 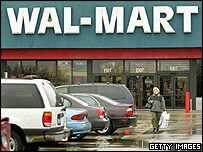 Now, the car and supermarkets have changed shopping habits and switched the direction of customers to out-of-town. And though department stores have tried to follow the customers haven't followed in droves. Mr Lundgren may well decide to hammer away at the new, merged company's two big brand names, Macy's and Bloomingdale's, perhaps losing some of the lesser known brands to concentrate the strength of the well-known names. And he may well push through a revamping of the stores. Federated under his rule has pared down the merchandise on offer to focus on more popular items. It's jazzed up sections for young people by introducing plasma screens on which teenagers can view themselves and the clothes they're trying on. There are computers for customers to send the pictures to their pals. It's introduced bigger fitting rooms. But it makes you wonder if it's just like your lovely old auntie trying to look younger by wearing trendy clothes. After all, Federated's sales in the last year were not much changed from what they were six years ago. It's true they might have been worse without Lundgren's efforts but they're hardly statistics to inspire cries of joy in the elevators of the nation's venerable stores. Venerable they are. Department stores were invented by the French. One Aristide Boucicaut opened the Bon Marche store in Paris in 1838 and that evolved into a department store (a store with different departments for different types of good) in 1852. The point was that all the departments were under one roof, offering goods at a fixed price. In 1858, Rowland Hussey Macy founded a "dry goods store" at Broadway and Chambers Street in Manhattan. He was a Quaker whaler from Nantucket who had a red star tattooed on his hand so he took that symbol as the store's logo. By the time Macy died in 1877, the store that bore his name stretched to eleven buildings. In 1902, the current Macy's was built on Herald Square in New York and it became one of the wonders of the new world as the "largest store on earth" with nine storeys and thirty-three elevators and a pneumatic tube system to whoosh money and messages around the complex. All very modern at the time. But that was then and this is now. When was the last time you shopped at a department store?